chlorophyll known as a potent detoxifier. It works in the digestive system and helps to keep healthy pH, cleanse the colon, combat free radicals, speed wound healing. Effective treatment of gastritis and peptic ulcers using Chlorophyll based supplements is well established in Japan. • Vegetable Glycerin (as a Preservative). Chlorophyll is a pigment found in dark green plants that is important for photosynthesis to take place. However, this pigment does more than just facilitate energy production in plants: it has a very similar molecular structure to hemoglobin (the molecule which carries the oxygen in the human blood). 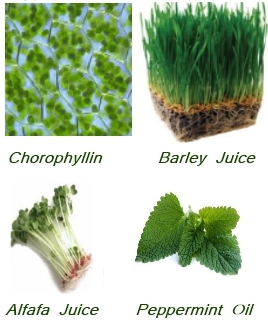 Chlorophyll has been shown to help boost hemoglobin production and thus increase the oxygen level in the blood. Chlorophyll has also proven to provide protection from various chemical carcinogens, found in fungus-contaminated and overcooked food, by strengthening the cells. The metabolism of these chemicals is harmful to DNA. In addition, chlorophyll has anti-bacterial properties and can help decrease the growth and development of unhealthy bacteria in the body. According to studies form the Linus Pauling Institute, chlorophyll acts as an antioxidant in the body and actually helps fight cancer cell growth. In a study, published in the Journal Mutation Research, the anticancer effect of chlorophyll was compared with that of beta-carotene and vitamins A, C and E. Chlorophyll was proven to be a more effective antimutagen than any of them. The arabic name AL-FAL-FA means father of all foods. Alfalfa is high in protein: it has 18.9% of ptoteins as compared to beef at 16.5%, eggs at 13.1% and milk at 3.3%. It contains chlorophyll which is a poweful natural detox cleaning blood, liver, urine and dijestive tracts. The ancient Greeks used alfalfa to treat a variety of diseases including bladder and kidney conditions. Traditional Chinese medicine uses alfalfa to treat kidney stones. There is convincing clinical evidence that alfalfa lowers cholesterol levels, particularly in cases of type II hyperlipoproteinemia. It appears that the fibers and chemicals in alfalfa stick to cholesterol, so that it doesn’t stay in the blood so it can’t be deposited on blood vessel walls. Even more exciting is that it seems to lower bad cholesterol (LDL) while leaving good cholesterol (HDL) alone. Chemicals in alfalfa have mild diuretic properties, which may promote the loss of water from the body therefore alfalfa may relieve swelling caused by excess water accumulation. Barley is an excellent food choice for those concerned about type 2 diabetes or pre-diabetes because the grain contains essential vitamins and minerals. is an excellent source of dietary fiber, particularly beta-glucan soluble fiber. which reduces the risk of Type 2 diabetes and colon cancer Research shows that barley beta-glucan soluble fiber promotes healthy blood sugar by slowing glucose absorption. According to the FDA, barley’s soluble fiber reduces the risk of coronary heart disease and can lower total cholesterol levels and low-density lipoprotein (LDL) cholesterol, which is typically referred to as the “bad” kind. It is also a good cure for digestive problems like constipation. Barley contains antioxidants, which are also important for maintaining good health. Specifically, antioxidants work to slow down the rate of oxidative damage by gathering up free radicals that form when body cells use oxygen. Peppermint oil comprises vitamins A and C, omega-3 fatty acids, and minerals including potassium, manganese, iron, magnesium, calcium, and copper. The numerous health benefits of peppermint oil include its ability to treat several health problems. Peppermint oil is used as a flavoring agent in food and is said to cure indigestion. Being carminative in nature, peppermint oil helps to dispel gas. It also eases stomach and bowel spasms and is the best antidote for an upset stomach. Peppermint oil acts as a stressbuster. It is used for relief from stress and pain including a nagging headache. The menthol in peppermint oil helps to clear the respiratory tract. PhytoLife is taken with water to supports the body’s detoxification process. Best way to take Phytolife is about 3 teaspoons in a glass of water after two meals in the day like dinner and tea. This will balance your pH level. There is no problem with taking more if you wish. In fact, there are certain diseases which thrive in acidic conditions and when you get rid of the acid you get rid of the condition. Phytolife should be kept in the fridge after breaking the seal and do not drink from the bottle. Use pH testing strips from a pharmacy to track of your pH so you can keep it as close to neutral as possible.